On December 6, ACS Publications hosted a Reddit Ask Me Anything (AMA) with ACS Nano Editor-in-Chief Paul S. Weiss. Professor Weiss is a leader in nanoscience and nanotechnology, with his lab focusing on understanding chemistry and materials at the smallest of scales. He is a Distinguished Professor of Chemistry & Biochemistry, as well as Materials Science & Engineering at the University of California, Los Angeles, as well as the California NanoSystems Institute. Redditors were very curious about innovations in nanotechnology, especially in areas where science and science fiction seem to overlap. Are tiny robots the way of the future or purely speculative? Read below to find out. /u/Ali_Safdari: If yes, what do you think they’ll be like? Clusters of enzymes that catalyse a particular series of reactions; or microscopic metallic insect-like creatures? Professor Weiss: Our abilities to have molecules and assemblies move under control or responsively are very limited. (I work in this area!) On the other hand, there are proofs of principle in biology, viruses, biomolecular machines, etc. Our first successes in making molecular machines have been with hybrids, where we make (relatively small) modifications to biomolecules and assemblies or even modify viruses and parts of cells to function in some new or better way. One can (and nature does) cluster enzymes and have them work in an assembly line. Here is an example from nature (in ACS Nano). Here is a illustration of the synthesis and assembly of the proteins making up a biological nanoassembly. /u/iorgfeflkd: Do you feel that the meaning and implications of “nanotechnology” have evolved over the years? In what ways? How do you feel about the evolution of the term? Professor Weiss: Yes, the term is evolving, both for specialists and the public. I think it is critical to communicate to the public (and each other) what we are doing and what we are trying to do, rather than letting science fiction versions of nanoscience and nanotechnology determine that perception. Many of the other questions relate in some way to this issue and that is one reason I am happy to do this AMA! /u/bluemutt: How has battery technology affected your research? Is there any significant drawbacks with the lack of battery progression over the years? Professor Weiss: Drawbacks- absolutely! We have already glimpsed how we could do better if we had better battery technologies. Until recently, I did not think that I personally had much to offer in this area. Then, one of my students, Andrew Serino, and a colleague in Materials Science & Engineering, Bruce Dunn, convinced me that the exquisite control that we have over surface functionalization could be of use, so we have put one toe in the water (and Andrew is probably working on a manuscript right now!). /u/Bambam9032: US Senator Ron Wyden once said: “My own judgment is that the nanotechnology revolution has the potential to change America on a scale equal to, if not greater than, the computer revolution.” Do you agree with this statement? What industry do you see nanotechnology having the greatest impact on in the near future? Professor Weiss: I would argue that nanotechnology has been partly responsible for the computer revolution. 😉 Seriously, it is not a competition. Both fields are moving the world forward. We have already seen incredible impact on information technology. One of the key aspects of nano is that it is also the scale of function in biology. We can use nanoscience and nanotechnology to understand biology and then hopefully turn it around and learn to interact more effectively with biological systems. /u/shiruken: As nanotechnology begins to enter the market for consumer use, will new disposal protocols become necessary to prevent nanoparticles from accumulating in unwanted places (rivers, lakes, etc.)? How have laboratories handled the safe disposal of such small objects? 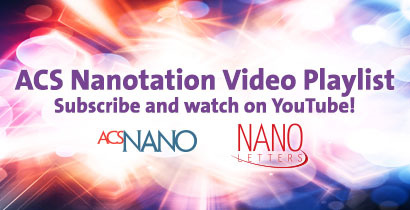 Now on YouTube: The ACS Nanotation Video Playlist!